What is the price of Under Armour Polo Tee plus printing in Singapore? Where can we find the cheapest Under Armour Polo plus customization (printing of name/logo etc.)? This is a question that Under Armour fans will be interested in. To answer this question, let us first look at your needs. Are you simply looking to get a single piece of Under Armour for yourself plus customization? Or are you looking for something for your team/company? If you are looking for a single piece, and you are not too concerned about price, there are two easy ways to get this done. First, you can visit any Under Armour Retail Store or Under Armour Online store and purchase an Under Armour Polo of your choice. Next, you can bring your Polo tee to us or any other reputable printer/embroidery company to get your logo printed on it. The total cost will be the cost of the Under Armour Apparel (price you paid at the Under Amour Retail or online store) + printing costs (depending on type of print, complexity of print, size of print, whether design is needed etc.) A name print starts from $5. Another way will be to purchase from us directly. 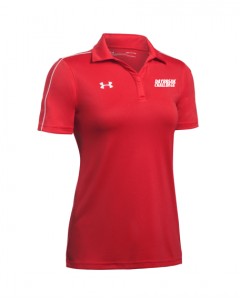 As an Under Armour corporate distributor, we usually sell in bulk quantities of 15 and above directly to teams and corporates, but we do sell 1 piece upon request. What you will get for 1 piece and above will be a bundle pricing of apparel plus print, which is usually cheaper than buying an apparel separately and getting it customised. If you are looking for a single piece, and you would like to go as budget as possible, you can either look for Under Armour items on discount online (UA Singapore) or visit premium outlets in Malaysia to get a piece of Under Amour and get it printed/embroidered. Otherwise, you can also look for our sister company (Quirky Designs) on platforms like Qoo10, Lazada and Shopee, where we have certain Under Armour styles on odd sizes clearance, where you might be able to find some good deals. If you are a corporate/ team looking for Under armour Apparel with customization, the best way is to talk to us at Ark Industries. Unlike Under Armour Retailers which has limited stocks, as an Under Armour corporate distributor, we hold large amounts of stock catering to corporates. We also provide customization, such as Embroidery or printing, depending on your needs. The price of getting Under Armour in bulk plus customization is usually at a slight discount from retail pricing without customization. What is the ballpark figure that you are looking at for Under Armour Polo Tee? The Under Amour Polo Tee usually comes in a few range, from Tech Polo to Performance Polo to Golf Polos. The price ranges from S$79 to S$109 (As per Under Armour Singapore website, April 2018). With printing and or embroidery, depending on the quantity ordered and the complexity of customization, a safe ball park figure will be $70 to $85. As one of the chosen Under Armour Corporate Distributor in Singapore, Ark Industries prides itself on its high quality print and embroidery. As a customer, if you have already invested in a quality Polo-Tee or training tee, it is important to find the right customization partner to work with to ensure that the customization is exactly as you expect. Do contact us at +65 63520988 or send us a message to find out more about our Under Armour products.